HF: Tymon Mellor wrote the article, Shatin – first powered flight in Hong Kong 1911, linked below, about the first powered flight which took place at Shatin on 18th March 1911. Charles “Chic’ Eather’s website mentions Charles Van den Born and this momentous event. 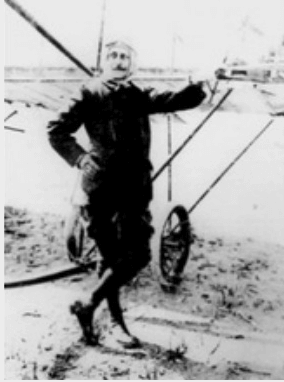 Charles Van den Born, the Henry Farman Company’s test pilot and instructor, had arrived on the steamer Donai. Accompanying him were three Farman Mark II biplanes, which could be dismantled into eight segments each. After lengthy negotiations the Hong Kong authorities approved his application to fly. They chose the Sha Tin area, doubtless satisfied that he could not spy on the Colony’s non-existent defences from there. A few months earlier they had refused American aviators a similar approval. I ponder why the Americans were a greater risk than a Belgian! IDJ: re Van den Born and flights over Hong Kong. This was related to concerns by the military establishment in Hong Kong on possible aerial spying over their defences. Rather ironic when you could walk to the top of most hillls and mountains in the terrritory and look down on the installations at your leisure and sketch or photograph them. A law existed until at least 1920 that flights near the harbour area must be kept below 150 feet. This hampered the new aerial services proposed by de Ricou between Macao and Hong Kong, as his visiting aircraft had to alight on the fringes of the harbour and taxi on the water into the inner harbour, all the while competing for space with numerous Junks, sampans, ferries, commercial and naval shipping. Needless to say the service never took off although several trial flights were made. 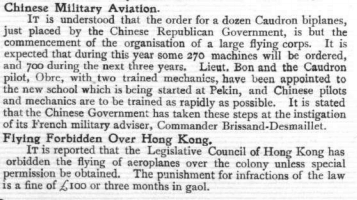 HF: This extract from Flight magazine from 15th Feb 1913 mentions the banning of flights over HK – was this a result of the purchase of planes by the Chinese Government mentioned? This article was first posted on 11th September 2014.